Speaking at the Distinguished Asian Lecture at Melbourne Law School on Tuesday, Professor Asshiddiqie said although the death penalty was still popular among his compatriots, there was a small chance it could be repealed in the near future. "It is quite a sensitive topic, abolishing the death penalty," he said. "We need public debate. We need public participation. This is important. It concerns human rights. It concerns everybody." Indonesia has the biggest Muslim population in the world, with more than 200 million of its people following the Islamic religion. Professor Asshiddiqie said this made it difficult to remove the death penalty, which is often used under the Islamic Penal Law Qisas principles as retribution for murder. He said the path to abolition could include restricting the death penalty as punishment solely to murder crimes, and the application of the Qisas principles to allow forgiveness. He also advocated for those on death row with a decade of good behaviour to have their sentence commuted to life imprisonment. His ultimate goal is to see the death penalty completely abolished. "Indonesian law still favours capital punishment over human rights and, in particular, the right to life," Professor Asshiddiqie said. "(However), it is possible that a new era could emerge in the future in which most people would want to abolish capital punishment. A dynamic change like that would require wider recognition of the universality and intrinsic value of human rights." During his time as the inaugural Chief Justice of the Constitutional Court of Indonesia (2003-08), Professor Asshiddiqie recommended for a change in the application of capital punishment; he was part of a 5-4 minority arguing that the right to life was absolute. The decision to continue to allow the death penalty to be carried out had a direct effect on the lives of two Australians, Myuran Sukumaran and Andrew Chan, as members of the 'Bali Nine' who were executed by firing squad in April this year following conviction for drug trafficking. But now, Professor Asshiddiqie said he offered a new perspective of capital punishment in line with the views of modern society, and urged people to listen. "I am not only talking to my fellow Indonesians, I am talking to Muslim nations everywhere, and to all democracies across the world," he said. 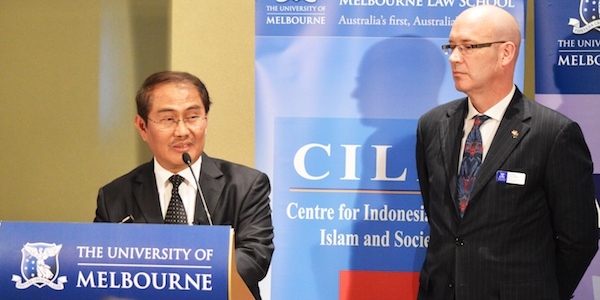 Professor Asshiddiqie spoke at the lecture as a guest of the Centre for Indonesian Law, Islam and Society, and the Asian Law Centre, with generous support from Allan and Maria Myers.